Nearly 400 pages of Trump University "playbooks" were publicly released Tuesday, detailing aggressive sales techniques and investing strategies taught at the real estate seminar business founded by Donald Trump. The documents are evidence in a California class action suit -- Art Cohen v. Donald J. Trump -- that alleges the now-defunct Trump University failed to deliver on its promises to provide a premier real estate education with instructors "hand-picked" by Trump. The suit also alleges that the University would "upsell" students from one seminar to more expensive ones. The order to release the documents was granted by U.S. District Court Judge Gonzalo Curiel after a request by the Washington Post. Trump's attorneys had fought to keep the playbooks private, on the grounds that they contained trade secrets. Curiel, however, didn't find enough merit in that argument. And, Curiel noted, there is now public interest in them since Trump "became the front-runner in the Republican nomination in the 2016 presidential race, and has placed the integrity of these court proceedings at issue." The playbooks contain instructions for "Trump team members" on everything from how to dress, how to run a Trump U event, how to deal with travel expenses and how talk to the media. But big portions are dedicated to how to bring in customers, encourage students to sign up for more courses and counter any objections or doubts they may have. Potential students would fill out profiles, and include a list of their assets. In a section called "identifying buyers," the playbooks instruct Trump team members to sort student profiles according to those who had the most liquid assets (over $35,000) to those who had the least (less than $2,000). Elsewhere in the playbooks, Trump team members were advised to "close the deal" after having one-on-one sessions with potential students and to push Trump University's most expensive package -- Gold Elite for $34,995 -- when feasible. "If they can afford the gold elite don't allow them to think about doing anything besides the gold elite." Finding lending sources for real estate investing were among the topics taught at Trump University's "Creative Financing Retreat," according to materials in the playbooks. A description of the retreat promised students they would learn more details about hard-money lenders, land contracts and seller-carried mortgages. It also covered the use of credit cards. "If a seller will take $10,000 down on a fixer-upper that you expect to make $20,000 on, why not use credit cards?" Among sales tools listed is the advice to play to people's emotions. "Don't ask people what they THINK about something you've said. Instead, always ask them how they FEEL about it. People buy emotionally and justify it logically." I don't like using my credit cards and going into debt: "[D]o you like living paycheck to paycheck? ... Do you enjoy seeing everyone else but yourself in their dream houses and driving their dreams cars with huge checking accounts? Those people saw an opportunity, and didn't make excuses, like what you're doing now." I'm going to try this on my own: "The risk isn't spending 35K - it's entering into the world of REAL ESTATE without specialized knowledge, guidance and trained professionals in the field holding your hand. WE are the safe decision. Fear is preventing you from investing in yourself." The Cohen suit is one of two active class-action suits filed by former students against the real estate seminar business, which effectively shut down in 2011. In addition, a third civil case has been brought in the state of New York by the State Attorney General Eric Schneiderman. Together the cases are represent the interests of thousands of former Trump University students. All three suits effectively allege that the seminar courses were a scam, that what students were promised when they signed up and paid for the courses was never actually delivered. The documents released Tuesday detail how Trump University was marketed and sold. They also detail the general content of the various seminars offered. But they don't indicate what happened after the sale was made. Some of the material offers a potential counterweight to claims that Trump University's aim was just to sell someone on the highest-priced course. For example, the 2007 sales playbook tells staffers, "you are here to meet the needs of your client, not to push product." And the 2010 version advises that one should "sell for a relationship, not a commission." 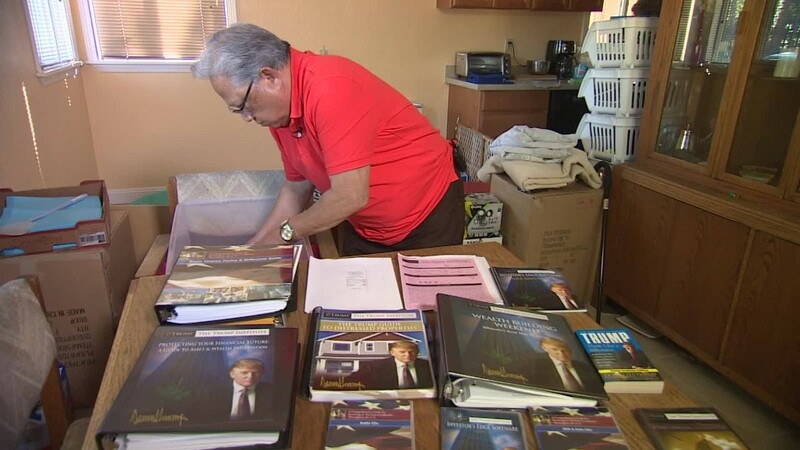 But other documents unsealed by Curiel on Tuesday contained damning testimony from former Trump University employees, calling the seminar business "a fraudulent scheme" that preyed on "preyed on the elderly and uneducated." -- CNN's Kathryn Vasel, Drew Griffin, Nelli Black and Curt Devine contributed to this report.